The Records of Hill End Hospital | Hill End, Archives | Out of Sight, Out of Mind? I wanted to reveal a few of my personal favourites from the Hill End records that I catalogued at Hertfordshire Archives and Local Studies in early 2009. Amongst the sensitive detail I was privileged to be able to peruse were many many horrendous cases of those with pervasive family mental problems behind them, years of institutionalisation ahead of them, and caught in a desperate present of being swept into a system that barely understood their needs. The happy outcomes of those who simply recovered and continued a normal life are not recorded nearly so well as the early deaths, suicides, self-harming, readmissions and attempted escapes. One of the ‘records’ we hold is actually a set of clothing. A bundle of standard issue clothing would have been issued to each new female patient. When the archives were collected there was a chance to rescue two of these bundles, one of which has now been sent to St Albans Museum, who are more familiar with the preservation of textiles. 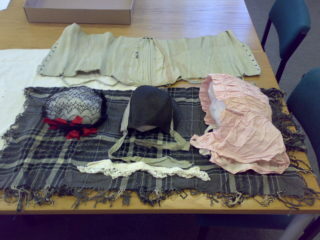 Each set comprises a black straw bonnet, lace collar, black lace cap, grey shawl, pink bonnet and corset. In a way that formal records can not easily show, and photographs often can, this kind of relic has an evocative and alluring power. Although it seems that a book was kept for everything (wine and spirit book, cake book…) the best are surely the Case Books. The four we have, two male and two female, are only a fraction of what there should be. These are mighty red volumes devoting two pages to each new patient. Typically, one side would include the hospitals and prisons and workhouses which they and their family had been in, and the other, their day-by-day decline towards death. Frequently there is a small photograph of the patient, taken probably at the lowest point in their life, and for some, this is possibly the only picture there is of them. An unusual section under ‘Photographs’ is that concerning Nurse O’Neil. This handful of personal snaps, dated about 1920, includes images of nurses and soldiers, and several of Nurse O’Neil herself. You might think of patients ‘absconding’, but that is the word used for her disappearance in 1922. Her own photos were left behind in a locker and became part of the Hill End records. Her uniform was also abandoned (and photographed many years later, although its whereabouts is now unknown). She may have returned to Ireland, but the reason for that, and what subsequently became of her, is unknown. All we have is a poignant insight into her vibrant life, before she felt she had to leave. The story of David Chapman was a totally unexpected discovery. In the hospital minutes of the 1960s, it was noted that permission had been granted for a film, Withdrawn, to be made. No further mention was made of it, and no evidence can be found of such a film being available to see, or buy. However, a web search playing with words such as ‘withdrawn’ and ‘film’ and ‘hospital’ began to point to a book by a young poet, David Chapman. Having been in a ‘Middlesex hospital’ in 1964, his account of his experience, together with secretly-taken photographs, was published in 1965 under the title, Withdrawal. The hospital was in fact Hill End, and the film was unfortunately never made. This page was added on 24/03/2010.